No matter where your remote jobsite is located, Globalstar is your trusted companion. The GSP-1600 delivers clear digital voice and data communications virtually anywhere, combining Code Division Multiple Access (CDMA) technology and a constellation of multiple Low-Earth Orbit (LEO) satellites. LEO satellites enable Globalstar to practically eliminate voice delay and maintain optimum battery life. The handset is also compact, which makes it easy to travel with. Plus it’s reliable, ensuring superior voice quality and fewer dropped calls. Like many Globalstar products, the GSP-1600 provides a reliable, low-cost data solution that ensures the ability to send information via email or the Internet virtually anywhere in the world. 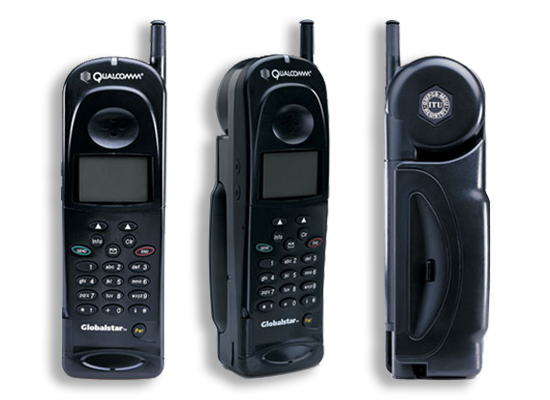 Globalstar Tri-Mode phones are designed with the flexibility to meet the needs of customers who already depend on wireless communications, but find themselves in areas where cellular or radio coverage is either unavailable or inaccessible. The Globalstar Tri-Mode phone is designed to complement existing fixed and cellular telephone networks by switching from terrestrial cellular telephony to satellite telephony as required. These features provide the Globalstar user the highest level of service and convenience. Through the GSP-1600, Globalstar offers efficient and reliable 9600 bps data services. Subscribers can access data services through the Globalstar network or through direct dial-up services from virtually anywhere in the world. Using the data cable to connect the Tri-Mode phone to a computer’s RS232 port, sending and receiving information has never been easier. The Globalstar Data Kit (not included) includes a software CD and cable for installation and use.